Iowa residents love their pets. Creating a caring, supportive home for your dog doesn’t need to be difficult, but it does require that you take certain steps toward making a safe and enjoyable environment. Many dog owners in Iowa choose to buy an electric pet fence, also known as underground, wireless, or out-of-sight fencing. When you purchase a hidden fence, you combine the security of a fenced-in play area with convenience and aesthetics. Making your yard into a safe place for your pup to play is an excellent step toward healthy and supportive dog training. At Dog Guard, our team of dog-lovers is committed to helping pet owners raise healthy and happy pets. We have applied an in-depth understanding of dog psychology and health to create a wireless dog fence system that permits free outdoor play with healthy and safe boundaries. By opting for an electric dog fence, Iowa residents can maintain their home’s attractive appearance while extending their puppy-proofing to the outdoors, too. With an electric dog fence, IA residents needn’t worry about local zoning laws or home resale value. A full-perimeter fence that’s sturdy enough to contain your own pet can be costly, unattractive, or both. Plus, even after investing in a tall fence surrounding their property, many dog owners are dismayed to discover that their clever pets manage to burrow their way around the fencing. With an electric fence, Iowa pet owners have a more elegant option: It’s both more practical and far more attractive. Avoid the eyesore of a fence, which can create a boxed-in feeling and diminish the apparent size of your property, a turn-off to potential future buyers. If you do move, you can pack up your hidden fence and reinstall it elsewhere. An electric fence from Dog Guard also offers a far more customizable alternative to traditional fencing. Many animal-lovers’ fondness for nature also extends to gardens, flower beds, or maybe even a koi pond. With out-of-sight fencing, you can set up boundaries to keep your pup from digging in the flowers or jumping into the fish pond. This degree of flexibility would be unthinkable with traditional fencing and would create a distracting eyesore. Adopting a dog is a major decision and requires ample consideration and planning. However, at Dog Guard, we believe that the most key element for any dog owner is love and consideration. We strive to make all of the other details as simple as possible. With an easy-to-install fencing system, you can focus on spending time with your pup, whether playing or training. 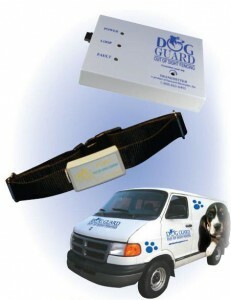 Finally, dog owners can rest assured that Dog Guard systems are humane and safe. Our fencing systems deliver a small corrective pulse to any dog wearing the receiver collar. We’ve designed three different collars, each delivering a distinct level of corrective feedback, so that dogs of any size and temperament can learn to identify the fencing boundaries quickly and comfortably. In fact, our system is so tailored to the individual dog that most pets learn to stay within the fenced areas after just two to three corrections. Naturally, raising a healthy dog is not just about fencing in an outdoor play area. However, at Dog Guard, we do believe that a reliable hidden fence is a great start. Dog training experts agree that dog owners can provide the most secure and supportive home for their pets by creating clear boundaries as well as giving attention to their pets. By installing an electric fence, IA dog owners take one big step toward that end. First of all, the fence transforms any yard into your dog’s “territory,” which gives any breed a sense of security and purpose. With a hidden fence, IA homeowners can also keep their dogs safe from local hazards, whether from traffic in urban communities or hunters in more rural areas. If you’re looking to adopt a dog in Iowa or if you and your pooch are moving to a new home, it’s well worth considering how you can create the most enjoyable and supportive environment possible for your four-legged friend. At Dog Guard, we believe that a safe, outdoor space is key to a dog’s mental and physical well-being. With wireless fencing systems, that pleasure for your pet needn’t interfere with your home’s natural beauty.